On January 31, 2019 about 1420 central standard time (CST), a Mooney M20K, N56359, was destroyed when it impacted a power line and, subsequently, terrain near a residential community in Katy, Texas. The private pilot was fatally injured. Instrument meteorological conditions prevailed for the private flight that was conducted under the provisions of 14 Code of Federal Regulations Part 91, and a visual flight rules flight plan had been filed. The airplane originated in El Paso, Texas approximately 1250 and intended arrival into West Houston Airport (IWS). Beloved father, grandfather and brother born in Rome, New York, July 29th, 1949 passed away January 31st, 2019. Celebration of Life February 10th 11 am - 2:30 pm 12750 Lake Center Run Court, Houston, Texas. KATY, Texas — One person is dead after a small plane crash near Katy Thursday. DPS troopers said the Mooney M20K 231 was found severely damaged in a heavily wooded area off Kieth Harrow in Katy. They said it appears the plane took a nose dive into the ground. Sources said the plane was bound for West Houston Airport. The pilot, identified as 69-year-old Calvert James Waller, according to Texas DPS, was killed in the crash. Harris County Sheriff Ed Gonzalez said the plane possibly struck a power line on the way down, knocking out power to the adjacent neighborhood. Centerpoint restored power to the area late Thursday night. 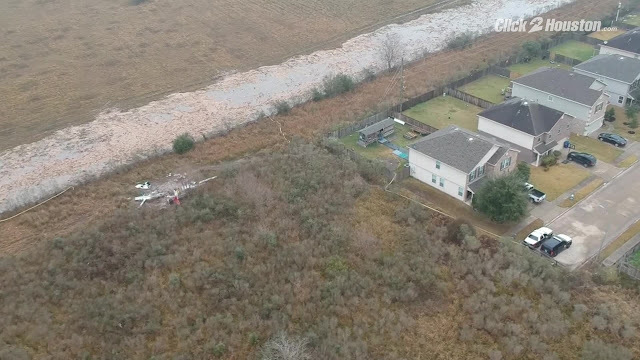 HARRIS COUNTY, Texas - At least one person was killed when a small plane crashed Thursday into a muddy field in west Harris County, officials said. Investigators are working to determine what caused the crash. Officials said the Mooney M20K 231 plane crashed in a field near a subdivision off Kieth Harrow Boulevard. Officials said the initial call came in about 4:15 p.m. about a low-flying plane in the area. Officials said it's too early to tell if weather was a factor in the crash. "We don't think anybody survived. There was significant damage to the airplane when it went down," said Capt. David Padovan, public information officer with the Cy-Fair Volunteer Fire Department. "Now, we're turning over the scene to DPS (Department of Public Safety) and the FAA (Federal Aviation Administration) for their investigation." Harris County Sheriff Ed Gonzalez said the plane crashed into a wooded area near an open field near the intersection of Westerpine Lane and Blossom Berry Court. Gonzalez said the plane almost crashed into homes in the area. Officials said the plane struck power lines in the area on the way down, causing power to go out in an adjacent neighborhood. "He tried to nose up to avoid that. Powered up and then stalled and went nose-first into the ground," said Sgt. Richard Standifer, with DPS. "I can only imagine if he lost it there he would have been in somebody's house for the first few streets in the subdivision." Officials said power was restored around 9:45 p.m. The crash was nearly much worse. "We're right at the end of the subdivision. The plane crashed about 150 to 200 yards into the field right behind the subdivision," Padovan said. He said the plane was a small, four-seat aircraft. It is not known how many people were on board at the time of the crash, but said they believe the person killed was the pilot. It is not clear if the plane was coming to or leaving from a Houston airport. Officials said they believe the plane left from an airport in El Paso. The crash happened near West Houston Airport, officials said. Officials said the ground was muddy where the plane crashed, and the fuselage of the aircraft was lodged in the ground. Neighbors who saw that plane as it was going down couldn't believe what they were witnessing. "It happened so fast. I was just like, 'Was that what I thought it was?' It was really close," Ariane Cook said. The identity of the person who was killed has not been revealed. Anthony Torres heard the plane crash and feared for his family and his neighbors. "It's sad. It's kind of scary, too, because it could hit anybody's house," Torres said. Not instrument rated. Apparently knew how to use the autopilot. Looks like he was looking for the runway, clipped a power line, then put it into the ground. IWS RNAV Approaches 15/33. Nothing else.